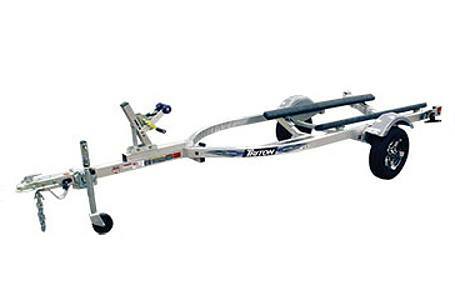 Dual bowed cradle frame design on single place trailers provide lower launch height and lower profile on the road while towing (on single place). Adjustable brackets and carpeted 6' bunks provides maximum adjustability to help balance and secure even large three seater crafts to the trailer. Keel guards and bow bumpers to protect the personal watercraft’s hull. Welded aluminum tabs on the rear cross member provides additional tiedown security for your watercrafts. Sealed LED lights installed with rubber grommets reduces vibration and protects them from the elements. Galvanized axles provide superior corrosion protection from salt water and other damaging elements. Adjustable ISA bow post allows you to custom fit the personal watercraft to your trailer giving you a secure fit and proper tongue weight distribution. Tire/Rim & Axle Choice: #06509 4.80 X 12C; Optional: #08875 ST145/R12E, #10384 ST145/R12E ALUM., #03392 ST175/80D13C, #09942 ST175/80D13C ALUM. Shown with options. Overall lengths are based on the bunks setup in the farthest position to the rear of the trailer. Hitch height is based on standard tires, upgraded tires will change loaded hitch heights. Prices and specifications may change without notice. Please note: It is the responsibility of the purchaser to adhere to the brake laws regarding trailers. For full information on the laws in your state, contact the appropriate State Motor Vehicle Department. Brake options will change the overall length of trailer. Brake option is Surge Disc Brakes on the Elite WCIV and the WC2-2 trailer. Recommended tongue weight 7-10% of GVWR. 1770 lb. ; Optional: 1790 lb. 1980 lb. ; Optional: 2000 lb.